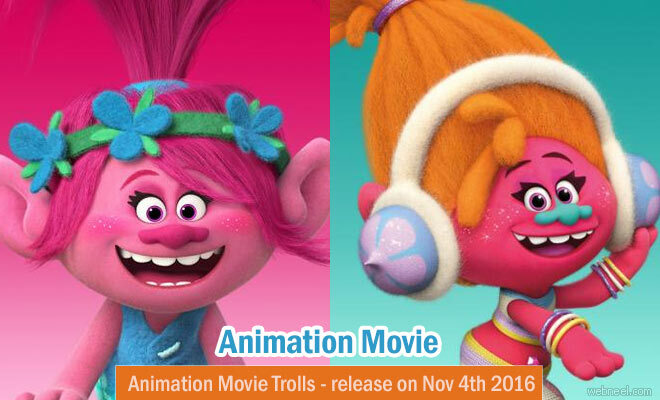 Trolls is a 3D animation musical comedy which is all set to release on November 4th 2016 in USA. From the creators of Shrek comes the most smart, funny, irreverent animated comedy of the year, DreamWorks' Trolls. This holiday season, enter a colorful, wondrous world populated by hilariously unforgettable characters and discover the story of the overly optimistic Trolls, with a constant song on their lips, and the comically pessimistic Bergens, who are only happy when they have trolls in their stomach. Featuring original music from Justin Timberlake, and soon-to-be classic mash-ups of songs from other popular artists, the film stars the voice talents of Anna Kendrick, Justin Timberlake, Russell Brand, James Corden, Kunal Nayyar, Ron Funches, Icona Pop, Gwen Stefani, and many more. DreamWorks' TROLLS is a fresh, broad comedy filled with music, heart and hair-raising adventures. In November of 2016, nothing can prepare you for our new Troll world, courtesy, 20th Century Fox. It's directed by Mike Mitchell and Walt Dohrn. The voice cast are Anna Kendrick( Princess Poppy), Justin Timberlake(Branch), Zooey Deschanel (Bridget) and many others. Story revolves around two trolls who are on a quest to save their village from getting destroyed Bergens, who apparently are creatures which tend to feast on trolls. This is the 33rd animated feature film by Dreamworks Animation. It's interesting to note that the song 'Can't stop the feeling' by Justin Timberlake has been nominated for the Teen Choice awards.